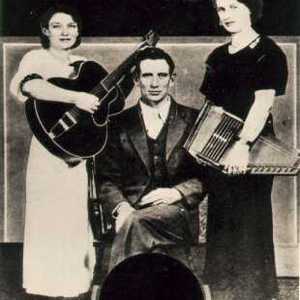 The Carter Family was a country music group that performed and recorded between 1927 and 1943. Their music had a profound impact on later bluegrass, country, pop and rock musicians, as well as on the U.S. folk revival of the 1960s. The original group consisted of Alvin Pleasant Delaney Carter (A.P. ; 1891-1960), his wife, Sara Dougherty Carter (autoharp and guitar; 1898-1979), and Maybelle Addington Carter (guitar; 1909-1978). The original group consisted of Alvin Pleasant Delaney Carter (A.P. ; 1891-1960), his wife, Sara Dougherty Carter (autoharp and guitar; 1898-1979), and Maybelle Addington Carter (guitar; 1909-1978). Maybelle Carter (later popularly known as Mother Maybelle Carter) was married to A.P. 's brother Ezra (Eck) Carter. All three were born and raised in southwestern Virginia where they were immersed in the tight harmonies of mountain gospel music and shape note singing. Maybelle Carter's distinctive and innovative guitar playing style quickly became a hallmark of the group. In the Fall of 1927 the Victor recording company released a double-sided 78 rpm record of the group performing "Wandering Boy" and "Poor Orphan Child". In 1928 another record was released with "The Storms Are on the Ocean" and "Single Girl, Married Girl". This one proved very popular. They stopped touring and recording in 1943. In 1987, the three daughters of Maybelle Carter - June Carter (also known as June Carter Cash, following marriage to Johnny Cash), Helen Carter and Anita Carter, along with June Carter's daughter Carlene Carter, appeared as the Carter Family and were featured on a 1987 television episode of Austin City Limits along with Johnny Cash. The Carters were elected to the Country Music Hall of Fame in 1970 and were given the nickname "The First Family of Country Music". In 1988, the Carter Family was inducted into the Grammy Hall of Fame and received its Award for the song "Will the Circle Be Unbroken". In 1993, the U.S. Postal Service issued a commemorative postage stamp honoring A.P., Sara, and Maybelle. In 2001, the group was inducted into the International Bluegrass Music Hall of Honor. In 2005, the group received the Grammy Lifetime Achievement Award. The Carter Family III carries on the tradition. The group consists of A.P. Carter and Sarah Carter's grandson Dale Jett, Maybelle Carter's grandson John Carter Cash and his wife Laura Cash.